A vintage print of Diane Arbus’ Max Maxwell Landar, Uncle Sam, N.Y.C. This vintage print made by Diane Arbus comes from the collection of Ruth Ansel, the legendary art director of Harper's Bazaar, the New York Times and Vanity Fair. This exact print used for reproduction as the lead image in Arbus' second magazine spread, 'The Full Circle', Harper's Bazaar, November 1961. The article and its accompanying text, written by Arbus, was reproduced in its entirety in Diane Arbus: Magazine Work, published by Aperture in 1984. The image is also reproduced in Diane Arbus: Revelations published by Random House in 2003. 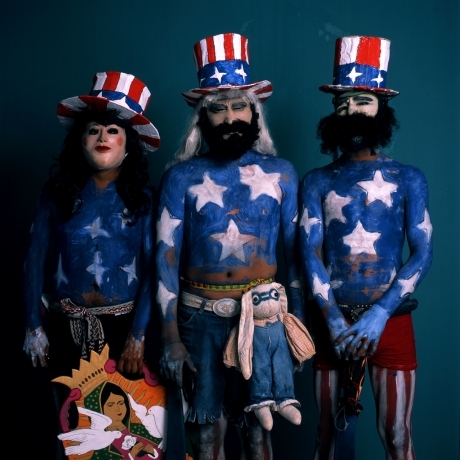 Lyle Ashton Harris’ Americas: Miss Girl, a rare print is from Harris’ well known early series “Americas.” This boundary pushing body of work explores issues of race, gender, sexuality and their intersections in the formation of subjectivity. The Solomon R. Guggenheim Museum in New York acquired “Americas (Triptych)” in 2012. A selection of work from the follow up series “Constructs” was included in the groundbreaking “Black Male” exhibition of 1994 at the Whitney Museum of American Art (New York) and Hammer Museum (Los Angeles). Mickalene Thomas’ iconic Le déjeuner sur l'herbe: Les Trois Femmes Noires from the sold out edition of 5. The photograph, inspired by Edouard Manet's famous painting, was blown up by became the basis for a large scale multi-media triptych that was first shown in a street facing window at MoMA in 2010. The triptych was then show in Thomas' solo exhibition Mickalene Thomas:Origin of the Universe at the Brooklyn Museum in 2012. The work was also installed as a wall-size mural created for MoMA PS 1 On Site 3: Mickalene Thomas in 2010. Marilyn Minter’s Plush series, from Minter's first artist book, Plush, published in 2014 by Richard Prince's Fulton Ryder Press as a limited edition of 500 copies. Prints from the series were included in the first exhibition of artist run super-PAC For Freedoms, co-founded by Hank Willis Thomas and Eric Gottesman, at Jack Shainman Gallery in 2016. This series was also featured in the artists' first retrospective "Marilyn Minter: Pretty/Dirty" at the Brooklyn Museum in 2016.